With legislation based on his ideas introduced last month, “Gridlock Sam” Schwartz’s plan to combat the very thing he’s nicknamed for is inching closer to reality. The front closet in the New York City offices of Sam Schwartz Engineering is full of bike helmets. Lined up like turtle shells along the top shelf, they’re one of many visible signs of the company’s pro-city, pro-movement ethos. 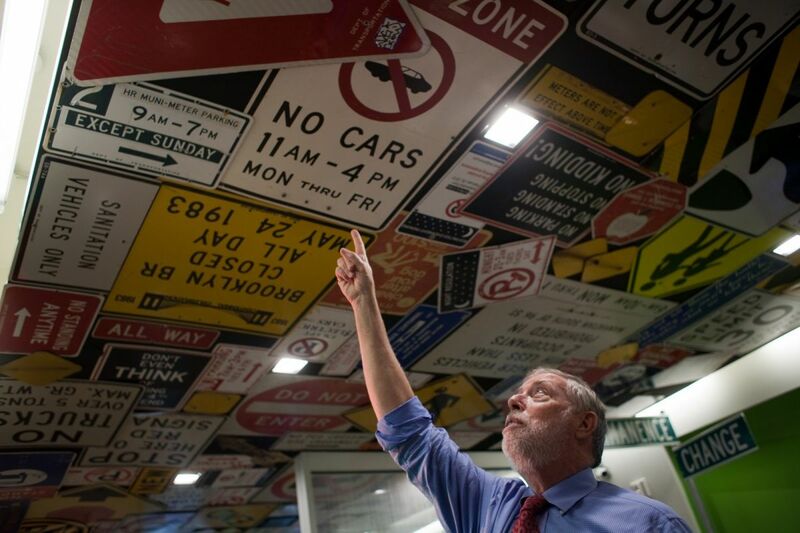 Traffic signs plaster the reception area, including the famous “DON’T EVEN THINK OF PARKING HERE,” which made its debut on New York City streets in 1982, when founder Sam Schwartz was traffic commissioner. 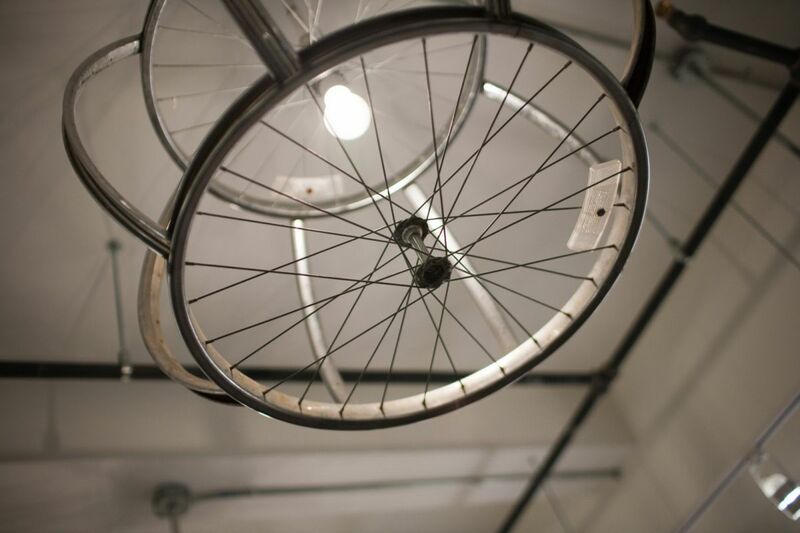 The conference rooms bear the names “Change” and “Progress.” Repurposed bicycle wheels serve as light fixtures. Looking around, it’s no wonder that this office serves as the neural center of a revolutionary plan to change the way New York City moves. For decades, Schwartz has been sketching what’s now known as the “Move NY Fair Plan” aimed at mitigating traffic congestion and improving transportation. In late March, legislation modeled after his ideas was introduced into the New York State Assembly. Borrowing key Schwartz elements, the bill promises to raise $1.35 billion per year in new revenue and $12.5 billion in bonds, much-needed money that will go to the repair and expansion of New York City’s fast-failing transit infrastructure. When I meet Schwartz at his Chelsea headquarters in January, the man better known as “Gridlock Sam,” on behalf of the term he helped coin in 1980, has just returned from a month-long part-vacation, part-work trip to Aruba. (He helped plan a battery- and hydrogen-fuel-cell-powered trolley system there in 2012; the prime minister now wants to extend it.) He wears a heather blue suit, crisscrossed with widely spaced bands of color. (I would call it, with affection, loud). His coffee mug commemorates the Williamsburg Bridge’s centennial with the image of a tiny cartoon span atop a tiny cartoon cake. His eyes, bright blue and boyish, shine above a toothy grin. He tells jokes, half smiling, as if he can hear the drumroll in the background. 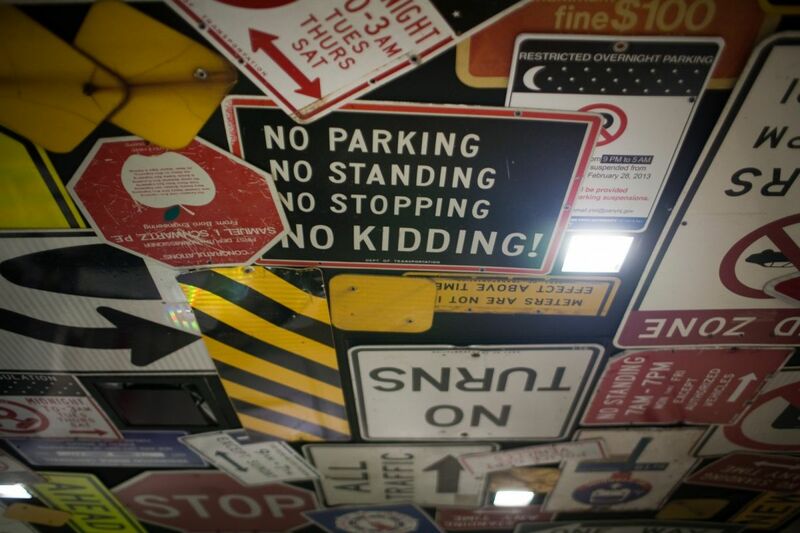 Sam Schwartz Engineering headquarters is decorated with traffic signs. Though the moniker identifies him with the thing he actively works against — immobility — Schwartz has taken up the mantle of “Gridlock Sam,” part transportation guru and part traffic advice columnist, with gusto. (Think if Captain Planet were renamed Captain Pollution.) He tweets traffic and service updates from around the city with the regularity of a DOT account, answers letters on his website from confused or frustrated commuters, and has written a column (also named “Gridlock Sam”) for the New York Daily News since 1990. Through the Move NY Fair Plan — which the New York Times’ Bill Keller called a “Brooklyn boy’s gift to his city” in 2012, mostly because the engineer has shaped the details on his own time and dime for years — Schwartz’s advice has a chance to impact much more than one puzzled bus rider. If the new legislation is adopted, advocates say, it would build safe, modern infrastructure, create more than 30,000 jobs, ease traffic congestion and reduce commuting costs for many New Yorkers. Schwartz was born in Brownsville, Brooklyn, to Polish immigrants in 1947, and raised in Bensonhurst. He married and had kids in post-riot/pre-gentrification Flatbush and was always a vocal and visible local. (Though he now lives in Manhattan, even his dog is named Brooklyn.) Schwartz was and is a guy who loves cities: Each of his childhood friends’ departures for the suburbs felt like a betrayal. Don’t even get him started on the Dodgers. After a stint as a cab driver and a stop at grad school to study traffic engineering, Schwartz joined the civil service in 1971. Move NY’s genesis can be traced back to these early days. Back then, the DOT moved to implement a “red zone,” banning cars from entering midtown Manhattan during business hours. Things proceeded far enough that street signs were made. Then-Mayor John Lindsay’s administration also wanted to charge tolls on the East and Harlem River bridges and had designs on converting Times Square into a pedestrian-centric plaza. (Sound familiar?) As staffers analyzed the plans, one of Schwartz’s colleagues said he worried about changes that could “lock up” the city’s “grid.” Thus, “gridlock” was born. During a 1980 transit strike, Schwartz used the term publicly, and the Times ran a story on the term’s usage; after that, the word went mainstream. Sam Schwartz points out a sign created for a failed plan to implement a “red zone” in Manhattan's central business district. Schwartz became traffic commissioner in 1982 and chief engineer in 1986, both under Ed Koch. Among his career accomplishments: He’s designed several of New York City’s most beloved traffic signs (“NO PARKING, NO STANDING, NO STOPPING, NO KIDDING”), and its gridlock alert system (which can deter up to 40,000 cars from coming into the city per day), and made small but significant vigilante edits to the city plan (eliminating parking here, widening a sidewalk there, erasing an access road elsewhere). The 127-year-old Carroll Street Bridge spans the Gowanus Canal. For example, take the Carroll Street Bridge, an 1889 wooden structure that spans the Gowanus Canal and connects the Carroll Gardens and Park Slope neighborhoods in Brooklyn. The federal government offered the city money to replace it in the late ’80s, and Schwartz says, “The federal money would have built a mini-highway.” He asked his team if they could do repairs to the original bridge in-house instead. They assented eagerly — at the time much of their work was being farmed out to contractors — and promised to meet their goal under time and under budget. One year of repairs versus six to seven years of construction? A cost of $1 million instead of $3 million? Schwartz’s decision to turn down the federal funding was easy: “We reopened the bridge on its centenary.” He even had them repaint one of the original traffic signs: “Any Person Driving over this Bridge Faster than a Walk will Be Subject to a Penalty of Five Dollars for Each Offense.” This detail delights him. “When we took over, we decided to tell the truth and take it to the public,” he continues. Koch was not happy. “I got called on the carpet.” When David Dinkins took over the office in 1990, he didn’t reappoint Schwartz. Schwartz went private in 1990, and opened Sam Schwartz Engineering in 1995. “My wife says it was the best thing that happened to me,” he says. He sounds like he believes it. The new sphere was different, but it had perks. “There’s more honesty in business,” he says. The new influx of money didn’t hurt either. It’s precisely that financial freedom that’s allowed him to take on huge projects like Move NY. He could afford to concentrate on the big picture. He wrote a book: Part-memoir, part-manifesto, Street Smart: The Rise of Cities and the Fall of Cars was published last fall. The firm has worked on the Atlantic Yards project, which still earns Schwartz some animosity, and the Mayor Bill de Blasio-endorsed Brooklyn-Queens streetcar project, which may prove to be similarly divisive. It consulted on Philadelphia’s coordination of Pope Francis’ recent visit to the United States. (Schwartz even walked across the city’s Benjamin Franklin Bridge to make sure his pedestrian plan for the pontiff’s arrival worked.) It helped Chicago DOT with the city’s long-term cycling plan. New York City, of course, is a client. When Battery Park didn’t want to build a bike path connecting East Side with West Side, Sam Schwartz Engineering found a workaround that added three-quarters of an acre to the park — a huge gain in a neighborhood with some of the most expensive square footage in the world. 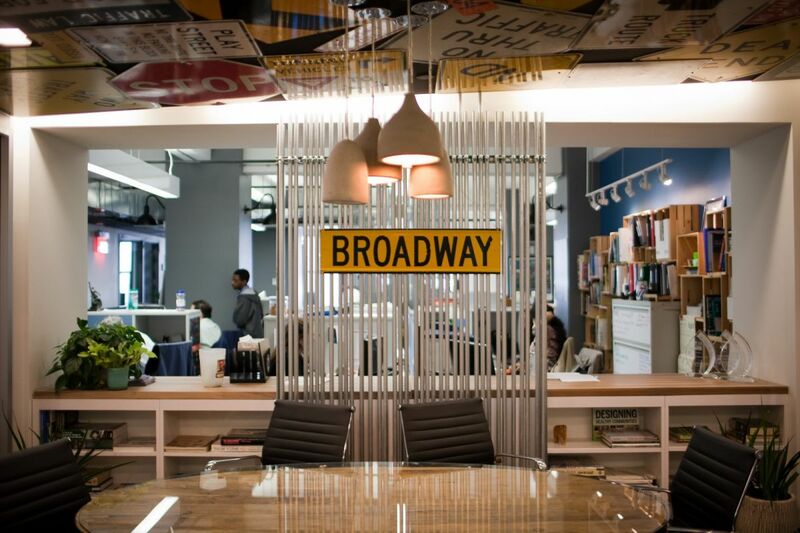 Repurposed bicycle wheels serve as light fixtures in the Sam Schwartz Engineering offices. With 40 to 200 people working on the firm’s pedestrian management side depending on the season, and 110 on its more traditional engineering and planning side, Schwartz sees his company as different in both scale and scope. “In the engineering and planning world, firms our size don’t exist in the New York market anymore,” he says. Many of the firms he competes with are enormous, some numbering up to 10,000 employees. If the Move NY bill is passed, he envisions an influx of money to thoroughly update the system, both to align the city’s transportation with today’s urban residents and to keep all those users safe. Principally, Move NY calls for a more fair system of tolls throughout the city. Bridges into the city’s most congested neighborhoods — the Queensborough, Williamsburg, Manhattan and Brooklyn — are all free to cross, but it can cost as much as $16 to enter Staten Island. This doesn’t make sense to Schwartz: Why must Staten Islanders, who have so few transportation options, pay so much? Why, likewise, do Manhattan and Brooklynites get to drive for free, especially when they have so many other options for travel? Move NY proposes new tolls on all the East River crossings, as well as lowering the price of existing tolls in the outer boroughs. Entering Manhattan’s central business district from the north will also cost private drivers extra, in the form of a cashless electronic toll, and taxi riders, in the form of a surcharge. The additional tolls will not only help cut down on the number of cars (and so gridlock) on the road, the plan reasons, but it will raise substantial annual funds that can be used to reinvest in infrastructure and begin much-needed transportation projects. Much would be funneled to the desperately underfunded MTA; another substantial chunk would be dedicated to road and bridge maintenance. Move NY has earned the praise and support of transportation activist, environmentalist and economist Charles Komanoff; Regional Plan Association President Tom Wright; and Janette Sadik-Khan, the Bloomberg-appointed former DOT commissioner who turned Times Square into an (incredibly successful) pedestrian mall and created nearly 400 miles of bicycle lanes. Even the local AAA affiliate, the Automobile Club of New York — a group that successfully sued in 1980 to block Schwartz’s ban on single-occupant vehicles from the East River bridges during rush hour — is on board. Indeed, the bill does have its critics. Avella is one of a handful of public officials, all from Queens, who actively oppose Move NY. His primary concern is the introduction of a new tax — the East River tolls — without sufficient guarantee that the money will be dedicated to transit. “There’s guaranteed money in the budget right now for mass transit and road repair,” he explains, “but those funds get raided every year for other projects.” He would prefer to raise revenue by legalizing sports betting or bringing back the commuter tax that was repealed in 1999. “People just hear Bloomberg redux,” Schwartz says, referring to the former mayor’s failed attempt to implement similar congestion pricing practices. The Move NY coalition continues to meet and talk with key politicians. De Blasio and Gov. Andrew Cuomo are crucial potential supporters, but neither has explicitly endorsed nor rejected the plan. Assembly Member Rodriguez feels optimistic. “I’ve been pleasantly surprised at the open-mindedness of my colleagues,” he says. “There have been more yeses than nos at this point.” Currently he has 15 co-sponsors on board his legislation, and is working to gather (ideally) 60 more. “The next critical step is to find a bill sponsor in the Senate,” adds Matthiessen. “What we lack is a titan of industry,” Schwartz says. “The sort of person David Rockefeller was in the past. Someone who is close to the mayor and governor, who can pick up the phone and tell them, ‘This is good for business.’” He (and the rest of the Move NY coalition) wouldn’t mind a larger budget for the Move NY campaign either, which would be used to educate the public and raise awareness. You can’t separate his urgency, his passion for the issue from the bill. In fact, many supporters believe he’s playing a critical role in raising awareness. Sam Schwartz designed several of New York City’s most beloved traffic signs. Steely White admires Schwartz’s candor. He recalls a metaphor the engineer once used: Expecting to drive for free in the busiest parts of Manhattan is like demanding your own elevator. “It’s a classic Sam Schwartz insight, and not just the insight but the ability to communicate it,” says Steely White, who waxed rhapsodic to me on a particularly compelling slide Schwartz once presented. The man himself is at once deeply optimistic and deeply pessimistic. The compass-straight consistency of his work, from his days as an entry-level engineer in the Lindsay administration to his time at the top of DOT under Koch to his years helming his own firm, is testament to his persistent hope. Schwartz won’t give up. Yes, he understands entrenchment and corruption — even as he staunchly works against them — but he also has witnessed catastrophic infrastructure failures and is unwilling to see them again. He believes the section of the Brooklyn-Queens Expressway running through Brooklyn Heights has a remaining lifespan of less than 10 years. And knowing the pace of government, he says, “it could take a decade to get through the paperwork” just to fix it. Still, Schwartz sees himself as an optimist. “I’m a glass-half-full guy,” he says. He just can’t turn off that part of his brain that is urban planner, civil engineer, New York City employee. For Schwartz, it’s “a big win.” The answer to his worries. “On the campaign trail, de Blasio said to me, ‘You are either brilliant or crazy or a little bit of both.’” Schwartz laughs. You could almost hear the drumroll in the background. Alan Chin was born and raised in New York City’s Chinatown. Since 1996, he has worked in China, the former Yugoslavia, Afghanistan, Iraq and Central Asia. Domestically, Alan has followed the historic trail of the Civil Rights movement, documented the aftermath of Hurricane Katrina and covered the 2008 presidential campaign. He is a contributing photographer to Newsweek, the New York Times and BagNews, an editor and photographer at Newsmotion and a photographer at Facing Change: Documenting America (FCDA). Alan’s work is in the collection of the Museum of Modern Art.